What are some of the impacts on children growing up in an inner city that is plagued by the environments of drugs, perceived lack of opportunity and violence that urban educators need to understand? The students through their project would be providing urban educators various insights into some of the behaviors and perspectives that these young people in their classrooms may have. The urban educators should be able to use the lessons within the finished project to better understand and engage the youth in their classrooms that are growing up in different urban neighborhoods in New York City and beyond. A group of students named Nas, Q-Tip, Large Professor, DJ Premiere, L.E.S., Pete Rock and AZ decided to examine their upbringings in Queens and Brooklyn using a social theory approach and write and produce a series of songs that would later be packaged and released in 1994 as Nas’ debut album “Illmatic.” Here is a closer examination of how “Illmatic” could have been the result of a project based learning assignment given in a sociology class back in the fall semester of 1992. Buck Institute for Education www.bie.org is a premiere resource for project based learning and they have created an essential checklist for educators to understand the elements that must be present in project based learning. 2. 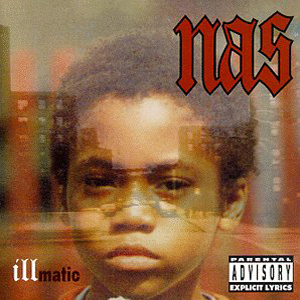 Develop 21st Century Competencies: The creation of “Illmatic” featured the collaboration of Nas and a collection of the premiere Hip-Hop producers of the day. The album communicated a story that spanned an array of emotions in a manner that was deemed acceptable (where often the only acceptable emotion to express is anger) by individuals growing up under the strictest of definition of manhood. Nas and AZ exhibits creativity and critical thinking as MCs with crafted rhymes that tell stories, embodied figurative language and elevated rhyming standards for MCs that followed for more than a decade. 3. Engage students in in-depth inquiry: The group held extensive conversations about life growing up in the ghetto and how they felt society at large viewed black and brown youth from the ghetto. The group consisted of individuals that were experts in their craft who was given the task of cultivating the budding genius that was in the writings of Nasir Jones. 4. Organize tasks around a driving question: The tasks were designated based on their talents and their ability to contribute their experiences to the following driving question: What are some of the impacts on children growing up in an inner city that is plagued by the environments of drugs, perceived lack of opportunity and violence that urban educators need to understand? 5. Establish a need to know: The media’s portrayal of black and brown youth from the inner city during this time frame was very stereotypically and selectively driven; it was critical that a group of young people begin to give firsthand accounts to better inform urban educators who were allowing the media’s portrayal of inner city youth to begin to influence how they engaged these youth in the classroom. 6. Encourage voice and choice: The students were given the freedom to tell their story in a manner that resonated with themselves and their peers. The students chose to speak through Hip-Hop and challenged the urban educators to learn on their terms as opposed to writing a standard report or story. 7. Incorporate revision and reflection: MC Serch served as the Executive Producer of “Illmatic” and was in charge of reviewing the songs with the Artists and Producers to ensure that the best final product possible was put out to the masses. 8. Include a public audience: The finished album was released on April 19, 1994 after singles were released and one song featured on a movie soundtrack. The project received the coveted 5 microphone evaluation from The Source magazine, which at the time was the premiere source of Hip-Hop journalism. For more insights as to how Hip-Hop can be used as a tool for effective Project Based Learning check out the following video http://bie.org/object/video/keep_it_real and join our weekly #HipHopEd chat every Tuesday from 9-10 pm EST. 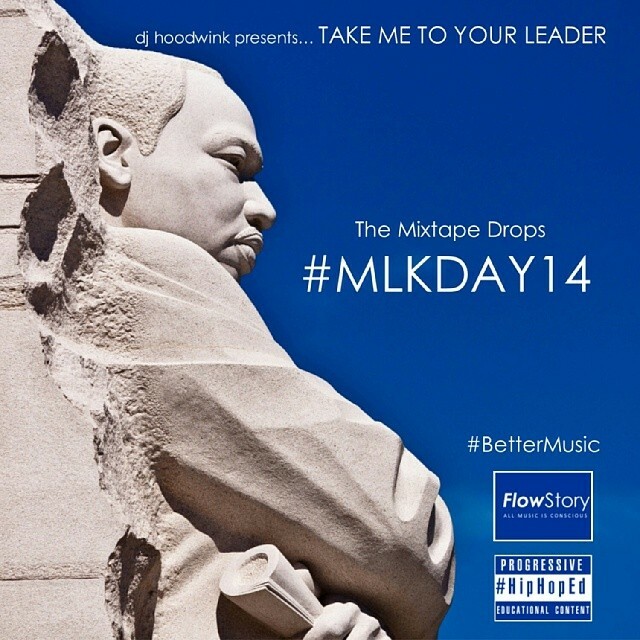 I’m sitting at my computer with my headphones on listening to “Take Me To Your Leader” created by DJ Hoodwink provided by @raptjr as my personal way to reflect on the day that the nation celebrates and commemorates the legacy of Dr. Martin Luther King Jr. This is not a standard mix tape review where I say this song is hot and this artist is featured. This is a mix tape overview where I expound on the intent of the mix tape and the hope that the listener gets the responsibility that comes within the re-creation of the project. To drop “Take Me To Your Leader” on #MLKDAY14 would naturally make you believe that the leader that we are being taken to is Dr. King and what he represented for us as a people. But if you really listen to the music and focus on the power of Hip-Hop as a medium that is now a worldwide phenomenon; the leader(s) are the voices of the artists on the project. Leadership is something that can no longer be embodied in an individual that can be assassinated in an attempt to stop whatever movement the individual represented. Leadership is a shared responsibility that we do not have the luxury of deciding whether to embrace without severe consequences for our failure to act. There are roles within the notion of leadership that position some as leaders, but not in the traditional sense that led to the assassinations of Malcolm and Martin amongst others. Leadership is the theory by which we embrace our connectivity to one another as people who are aligned by our experiences which include our victories, sacrifices and our sufferings. Music and art has always been one of our most powerful weapons in evoking collective thought that incite a people to the point that they see themselves and the world around them through the paradigms created by the music. Art is a continual remix of sounds, thoughts and method of expression; which inherently attaches a responsibility to all who dare call themselves artists. This ideology is not prevalent in our commercialized Hip-Hop that dominates American airwaves, but is bubbling in what we call the “Underground.” Is it a coincidence that the “Underground Railroad” is the name of the system that was developed to transport individuals from enslaved to free? Can the music on “Take Me To Your Leader” be a stop on the “Underground Railroad” of Hip-Hop music that can transport the mentality of our youth and adults from enslaved to free? A mindset that is free to question the way things are and presenting an alternative narrative that explains the way things can and should be? 1. Listen to Mix Tape with a group of young people and conduct searches for the subject matters that are in the songs. An example would be listening to “Dear Chicago Summer” and examine how violence increases in the summer and discuss ways that this pattern can be changed for summer 2014. 3. Track 28 “Wake Up Everybody” on the Mix Tape is a remake of “Wake Up Everybody” by Teddy Pendergrass, Harold Melvin and the Blue Notes in 1975. This creative expression is a great time travel bridge to begin to look at music from the past that called for us as a community to go higher and the Hip-Hop that is doing the same thing today. 4. Track 10 Jasiri X’s “21 Forever” provides the backdrop to look at the portrayal of young adulthood that is presented in commercial Hip-Hop and compare it to the role that young people played in the civil rights movement. Teach our young people what the Freedom Riders were doing as 21 year olds. In commemoration of the 40th anniversary of the party in the recreation room at 1520 Sedgwick Avenue in the Bronx, New York on August 11, 1973 hosted by DJ Kool Herc, we decided to curate a top 40 list. Many people view this as the beginning of contemporary Hip-Hop although the phrase (Hip-Hop) wasn’t used to capture the elements of the budding culture until Afrika Bambaataa in 1974. We didn’t want to curate a typical top 40 list based on sales or the pontificating that has become customary when individuals create lists of the top MCs in the game at a moment or in history. We decided that we would create an objective approach to curate a subjective list of the top 40 songs in the history of Hip-Hop based on educational value. There was a clear distinction between educational value and educational content. The determination of educational value was determined more by the ability of the educator as well as the content of the song. To determine educational content would have required a set of educational standards to serve as the benchmark of the content and this probably would have garnered a very short list. The plan was to have the chat on Tuesday July 30, 2013 serve as the opportunity for the #HipHopEd community to present songs that they believed should be on the list. The time period where we would count suggestions was from 9:00 pm EST on Tuesday July 30, 2013 until 9:00 am EST on Wednesday July 31, 2013. The weekly #HipHopEd chats only last an hour but we have a growing group of Hip-Hop Educators in the United Kingdom who are fours ahead of our time zone, and we wanted to give them a chance to participate without having to stay up in the middle of the night. 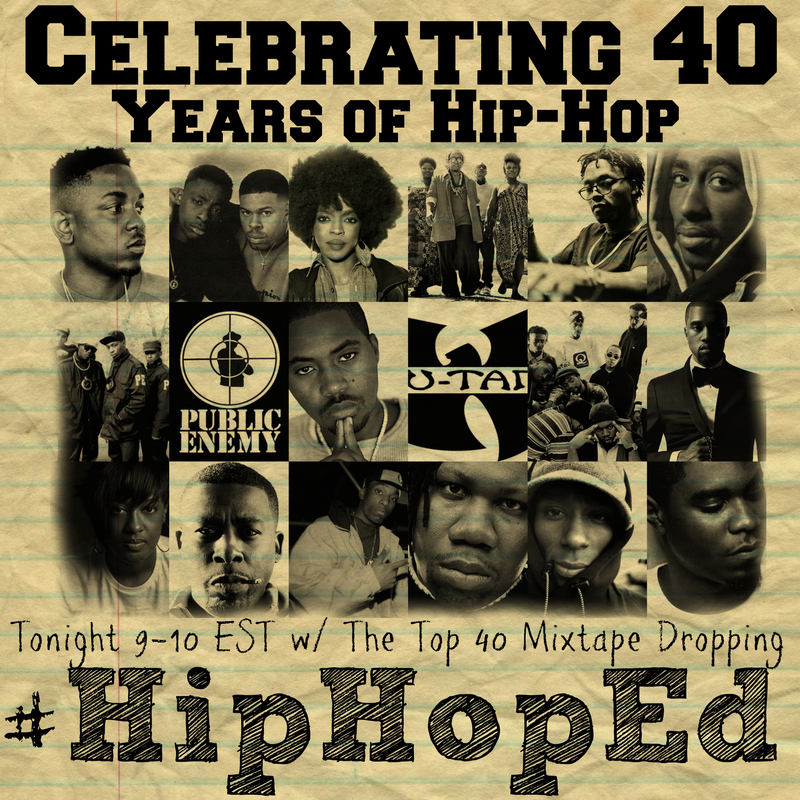 The tweets that we counted included the hash tags #HipHopEd and #T40S (Top 40 Songs). We would capture the full 12 hours of tweets and count each song that was mentioned. Once a song was tweeted we also counted the amount of times the tweet was retweeted (RT) and or made a favorite (FAV). If there were two songs that had the same number of total votes the order they would be placed on the list was at the discretion of the leadership team of #HipHopEd. The chat scheduled for Tuesday August 6, 2013 would be where the top songs would be revealed in groups of 10 and in 15 minute intervals. The 15 minute intervals will provide a window for each list of 10 songs to be discussed and or debated. The chat that took place on July 30th was amazing because the participation level was so high that we trended on Twitter well beyond the regular length of our chat which is an hour. The participants were of various ages from teenagers to individuals in their 40s and beyond. The participants were educators, students, artists and fans. The subjective determination of “educational value” was presented in ways that to some were easily accepted and in other instances, not so much based on the lack of RTs and FAVs. The chat was captured on Chirpstory http://chirpstory.com/li/103442. Chipstory is a website that allows you to search tweets using a particular hash tag and then gather them so they flow like a story. Once the Chirpstory is complete the link can be shared and viewed by anyone in our #HipHopEd community and beyond. The Chirpstory also serves as a great reference tool which allows us to go back and review past chats and assess the impact of the chat based on the times the story has been viewed. During week between July 30th and August 6th we sifted through all the data that we collected and we put together the top 40 song list. We had to make an executive decision on song number 40 because there were 3 songs remaining with the same number of votes for the final slot. Outside of this executive decision the list shaped out to clearly represent the songs that were tweeted with accompanying RTs and or FAVs during the voting period. 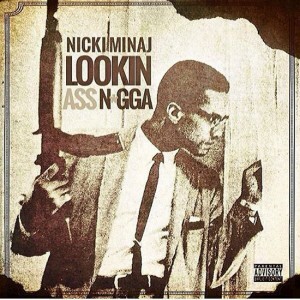 The songs on the list represented a wide spectrum of Hip-Hop based on the years that the songs were released. Ten percent (4 songs) that made the top 40 came from artists that were independent and Fifteen percent (6 songs) came from the ladies and another song featured a lady on the chorus. The educational value of the songs ranged from the song’s significance in the history of Hip-Hop, the subject matter addressed in the song and the structure of the song. The true educational value of the #T40S will be measured on what educators and individuals do with the list. This chart is being used around the country as a tool to ask critical questions of youth and adults using the lens that Hip-Hop provides to discuss the issues of life that often times we find difficult to discuss. This chart is full of introspect, anger, warnings and challenges for us as a community. 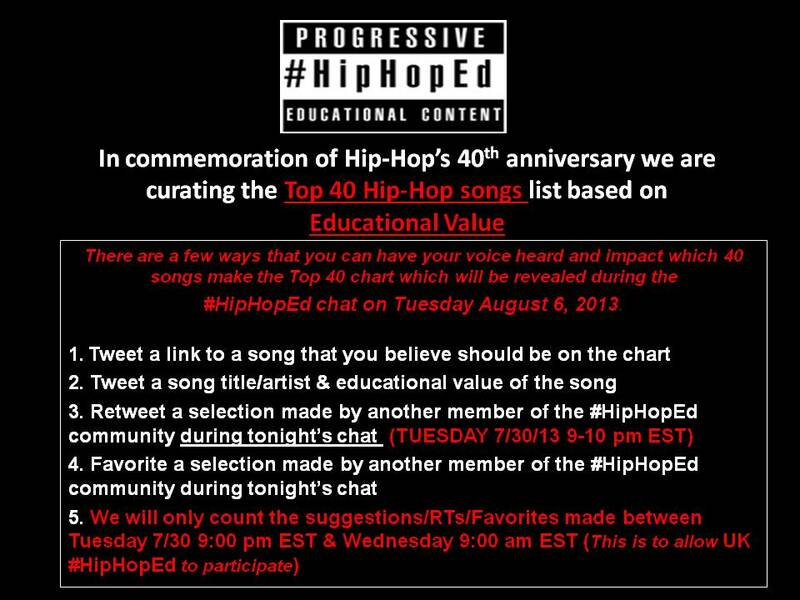 Here are the links to the four lists that were released during the #HipHopEd chat on Tuesday August 6, 2013. I look back fondly on my upbringing in the housing projects of East New York, Brooklyn. My environment then, along with hip-hop, included me in its blended family. The family values that I learned early on from hip-hop taught me unconditional love and helped me to be a father in my own blended family today. I grew up in a family of five boys and I am the youngest. My father was in the house until I was about ten or eleven. During adolescence I was blessed to be fathered by men who guided me with wisdom and purpose throughout my life. Men such as Jeremiah Jones (who headed the youth center in my projects) and the brothers who, despite their life choices, knew right from wrong and steered me away from the mistakes that they made. I also came to know the blessings of family life through the positive influence of hip-hop. The music and the culture served as a bond that formed many relationships. This new phenomenon called hip-hop served as the rationale to put differences and personal agendas to the side in an effort to be a part of something that was bigger than the individual. Hip-hop encouraged individuals to form the positive family bonds that previously were presented to inner city youth in the form of gangs. In fact, the most renowned MCs where parts of groups or crews: LL Cool J was partnered with DJs Bob Cat and Cut Creator; Rakim with Eric B; KRS-One with Scott LaRock and Boogie Down Productions; Queen Latifah with the Flavor Unit; Chuck D with Public Enemy; Scarface with the Geto Boys; Ice Cube with NWA; and Big Daddy Kane with Mr. Cee and the Juice Crew, just to name a few. Whether they intended to or not, all of these groups promoted the value of (and need for) strong family ties. I carried this perspective throughout my college years and it helped me form a family bond with a group of friends who I consider brothers to this day. We created our own standards of manhood and look out for each other constantly: we attend each other’s weddings, celebrate the birth of our children, and so on. In college, I was blessed to have another strong connection with a man who guided me into adulthood. He continues to be a strong father figure in my life today. Dr. Barron H. Harvey was the man who fathered me while, in my head, I was having conversations with my biological dad that now remind me of one of lyrics by Lupe fiasco: “I want you to be a father / I’m your little boy and you don’t even bother / like “brother” without the R.” my relationship with my dad had eventually became non-existent to the point where I would wonder: “You see what my problem is? That I don’t know where my poppa is.” Those were the thoughts in my head that laid heavy on my heart as I transitioned into adulthood, despite the father figures in my life. As a young adult, with my personal and professional lives ahead of me, I met Mr. Mahmood “Billo” Harper. Mahmood invited me into his world and I saw in him a futuristic interpretation of myself as a “Hip-Hop Dad.” Mahmood showed me how to incorporate my love of hip-hop into my business and family life. Within hip-hop culture, the crews evolved similar to how relationships develop in personal life. Rappers went from coming together to do shows and songs to coming together to establish businesses. This shift is exemplified in the emergence of Wu-Tang Clan in 1994. Wu-Tang redefined how to do business within hip-hop. The family structure of “the posse” was a new model. Hip-hop evolved from having crews on the street corner to having clans in the corner office . . . similar to how relationships can evolve from boyfriend/girlfriend status to a husband and wife union. As hip-hop continued to develop in this way, so did I. In 1998, I put aside my boyhood ways and got married. I became a husband and a father in the same moment because my wife, Vanessa, had a seven-year-old daughter. Raising my daughter Jasmine (I never use the term “step”) called forth all the positive images and lessons that were presented to me by hip-hop and by the wise men in my life— both my elders and my peers. I was now initiated into a new sort of hip-hop crew. Within my new family, some of hip-hop’s basic values and practices applied: nothing should break down the unit, posses roll deep, and your word is your bond. And if someone in the crew presents an “outsider” (i.e., me, in this case) as being “down,” then the so-called outsider must receive the same love and support as every other member of the family . . . regardless of tenure. I joined Vanessa and Jasmine’s crew by making my wedding vows to both of them. I knew that the success of my marriage would be based on my ability to keep my promises to my wife and my new daughter. Without these rules to live by, I don’t think that I would have been psychologically or emotionally equipped to be a father to Jasmine. By 1999, I was a happily married man in my thirties. I was still a hip-hop head and I began to notice a growing frustration within the hip-hop community—mostly centered on the issue of fatherhood. More and more, rappers began to address the pain caused by fathers’ dysfunctional relationships with their children. Though I had forgiven my father for his not being around, I could still relate to this pain. It motivated me to do my best for my daughter and for the young people that I worked with as director of the teen program at Martha’s Table (Martha’s Table is a prominent non-profit community-based organization in Washington, D.C.). Many of the teens in my program don’t have fathers or father figures in their lives. Through my work, I felt I was answering Quan’s hip-hop plea: “Can we please have a moment for children who got raped or murdered, or trapped in the system who never knew their father, never learned to dream but was guided by drug dealers, killers and crack fiends.” I have established long lasting bonds with most of the teens in my program over the past twelve years and I saw, once again, the value of the blended family. Still and all, I longed to have a son. I believed a son would help heal any remaining wounds that were created by my biological father. In 1999, god answered my prayers and my son Isaiah Jeremiah Ezra Jones was born on my thirty-first birthday. He was named in honor of all the father figures who filled in the gaps for me and my wife. Since that day and moving forward, Isaiah will always know what life is like with his dad. His life challenges will not be based on the hard circumstances that come with growing up in a single parent home. Instead, he will benefit from my having broken a cycle of bitterness and my having learned how to love past pain. The father and the man that I become; and the man that I will raise my son to be, are deeply rooted in my belief, trust, confidence, and reliance on Jesus Christ for all things. As I continued to mature into manhood, I found comfort and joy in serving Jesus Christ in spirit and in truth, in my rewarding work, and in a faithful marriage. All these things helped me to be secure in my identity and purpose in life. When teens ask why I am the way that I am and why I care as much as I do, I love that I get the chance to tell them that I love them because Jesus first loved me and that He gave me so many fathers to model after. I believe I must be a father for them too. I am also proud to tell them that hip-hop culture, contrary to popular belief, has been a guidepost for me to follow with regard to building a family unit—be that family in the household, in the projects, on the block, or at the local community center. The role that hip-hop has played in my life is based on an insight that was god-given. Hip-hop influences my ministry from the pulpit as a minister and I have been afforded a spiritual father who leads me as my Pastor, Bishop Larry H. Jordan, Sr. I am able to reflect on hip-hop culture in a way that many see as contradictory to how hip-hop has been defined by society. I know better. In the words of Inspector Deck I say, “Leave it up to me while I be living proof to kick the truth to the young black youth.” my life with hip-hop, family, mentors, and friends has consisted of the love, lessons, learning, and leadership necessary to mold me into what I am and all the things I will become. Sound Check: If you could do three things and not worry about the consequences of your actions or being disciplined by your parents or any other adults, what would they be and why? Ask a few students to read their responses and make a list on the board. Or you can have everyone read their top response of the three that they wrote down. Performance: Pass out the lyrics to “Young, Wild & Free” and then play the song. Have the students read along as the song is playing so that you know that they are paying attention because they will keep time with the song. Students should choose 3 of the 4 lyrics and write (3) sentences that explain what is being said by each lyric. In the song the emphasis of being young, wild and free is on using drugs and partying. I want you to attempt to rewrite the chorus and write a verse that focuses on other activities that young people participate in under the motto of “Young, Wild and Free.” In the chorus you should change the first two lines to include the other behaviors that young people participate in under their moratorium and therefore not considering the consequences. Your verse should talk about the fun that you have in doing whatever it is that you are doing and how society should really back off because you are “young” and this is what your youth is about. Your verse should be 12 lines in length. Performance: Each student will read their completed work in the front of the class and submit. So what I keep ‘em rolled up? And look clean don’t it? (If a person does not make a commitment to an identity or role after taking a moratorium, or if they don’t have a chance to take a moratorium, the person has a high risk for developing confusion about their identity and their role in society.) Analyze the two quotes from Nas’ song “2nd Childhood” and the statement in italics and write a short paragraph for each one telling what you believe could have happened to these individuals during the period of adolescence and their psychosocial moratorium that has them in these life conditions as adults. Ask a few students to read their responses and make a list of the reasons mentioned in the paragraphs on the board. Introduction: We are continuing our study on Erickson’s theory of adolescents participating in a “psychosocial moratorium” as a process of establishing their identity. The break from “real life” as the moratorium is called takes on different forms based on socio-economic status and the individual desires of the youth. Culture can play a significant role in influencing the behaviors that take place under the auspices of a “moratorium.” What happens when the behaviors that are being promoted are behaviors that are legally adult in nature and are irresponsible for adults to participate excessively? The song that we will be reviewing is “Starships” by Nicki Minaj. The song is very upbeat and promotes a spirit of partying and forgetting the worries of the day, but at what cost? Performance: Pass out the lyrics to “Starships” and then play the song. Have the students read along as the song is playing so that you know that they are paying attention because they will keep time with the song. – They say, what they gonna say? “Starships were meant to fly/Hands up and touch the sky/can’t stop ‘cause we’re so high/Let’s do this one more time” before each of your verses in your poem. You can choose which verse you want to go first in your poem. The two MCs pictured above, to the left, Busy Bee and to the right, Kool Moe Dee, are credited with participating in the first MC Battle in 1982. Over the past 30 years the MC Battle has been implemented in various forms from individual versus individual to crew versus crew. Hip-Hop as a culture also embraced the aesthetic of the battle in the other creative staples of Hip-Hop as well (DJ, Graffiti, and Break Dance). If you study the landscape of the South Bronx in the 1970s which is the decade that what we call Hip-Hop today was born (1973 to be exact) you have to acknowledge the gang culture that dominated youth culture. Within gang culture competitions were settled violently and were seemingly never ending. The Hip-Hop Battle provided an outlet for youth to compete in a manner that was non-violent and actually had a semblance of structure. As the development of the standards of excellence was established in the Hip-Hop arts, these standards were used as ways of determining who was the best or the victor in any battle scenario. There is research out there about the benefits of youth competing in organized sports. Young people develop self discipline, teamwork, sportsmanship, and confidence just to name a few character benefits of sports. It is easily accepted in our society because of the role that sports plays in almost every fabric of our lives. For those of us who were blessed to grow up alongside of Hip-Hop we witnessed the attributes that have been identified as the benefits of participating in sports, being achieved by those who participated in Hip-Hop Battles. In the inner cities you had the neighborhood youth who excelled in the various Hip-Hop Arts receive the same accolades that top athletes received for staring on their high school or neighborhood all star team. This article is not a piece to outline the history of the battle within Hip-Hop, but to introduce and reintroduce to some positive aspects of the Hip-Hop battle and it’s similarities to other more acceptable modes of competition. The goal is to open the minds of educators to incorporate the concept of the Hip-Hop battle in its various artistic forms into the classroom as method of developing and promoting communication, collaboration, creativity, and critical thinking amongst their students. To help present this theoretical approach, think about the academic based battles ranging from spelling bees, science fairs, multiplication/math competitions, and a game show called jeopardy. Oratorical battles in the form of debates are used to help distinguish the best candidate for the President of the United States in a similar fashion as the audience decided who won the legendary battle between Busy Bee and Kool Moe Dee. Make sure our students understand the difference between a battle and a beef so that the benefits of battling never give way to the burdens of beef!